Ford’s Probe was originally intended to be the company’s first FWD Mustang. That potential travesty was ultimately averted, but could paying the asking for today’s Nice Price or Crack Pipe GT prove to be another? Going by the book is a good idea when you’re baking a cake or attempting an emergency appendectomy with just some nail clippers while stuck in a disabled elevator car. Or so I’ve been told. It’s apparently less of a good idea when you’re trying to sell your old car, and that’s just what the owner of last Friday’s 1995 Toyota Camry wagon attempted to do. He listed the NADA valuation for the car and then set his price at that book’s top tier—$5,625. Fully 74 percent of you vociferously disagreed with his, and I guess, NADA’s thinking, dooming the seven-seat wagon to a Crack Pipe loss. Okay, I want to get it out of the way right off the bat that I don’t believe any of these people who claim to have been abducted by aliens from outer space. I think they’re all probably nuts or just attention seekers. That being said, I am fascinated by the whole alien probing thing. I mean, how did that even get started and why would aliens want to stick things up people’s butts? 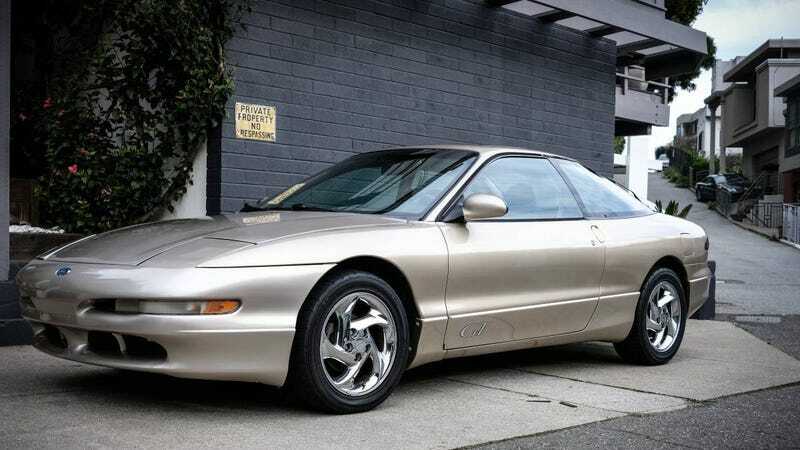 I bring up that consideration as one of the contentious factors that plagued the Ford Probe during its entire model life was that name—the Probe. It had, and has, negative connotations, and for that I blame the aliens. This 1997 Probe GT comes from the model’s ultimate year of popping out of Ford’s Flat Rock, Michigan assembly plant. The Probe, and its Mazda MX6 factory mate did battle in the once contentious small sporty coupe market, going headlight to headlight against cars like the Toyota Celica, Nissan 240SX and whoever sold the Eclipselalonlaser. In fact, Ford thought that category was the future of their pony-car profits and almost replaced the then long in the tooth Mustang with the Probe. It was so close to happening that the Probe’s rear bumper cap molds had to be redesigned to remove the MUSTANG embossing while the production line was being prepped. Today, the Mustang thrives. And the Probe? Well, the Probe is becoming an ever rarer example of Ford’s amazingly cool ‘90s styling tropes. This GT, in Sahara Gold over a beige interior is a prime example. Look at that pointy nose. Check out the flush glass and floating roofline. This was Ford at its finest. The first generation GT possessed similar features, but that car was far less successful in its execution. The second generation is arguably one of the best-looking cars Ford has ever produced. This one shows a little bit of wear and tear in that shapely body. Most of the issues are relegated to the bumper caps which do show signs of engagement. The rear seems to be the worst off with paint popping off in places and a good bit of crazing. Two areas of rust are noted by the seller—and kudos to him for pointing them out in the ad—but neither is structural nor seemingly invasive. Beneath that all, the car looks to be solid, and it all rides on chrome-plated factory alloys. The interior is another area where age and the car’s 147,000 miles show their presence. The seats there are all covered in what look to be snug fitting covers. The seller says that only the driver’s seat has issues making the cover required, but that he has done them all for constancy’s sake because he doesn’t like things mis-matched. You know, I’m liking this seller more and more. The rest of the car is otherwise apparently stock and yes, it does come with the factory spoiler which will be reattached prior to the title transfer. That title is said to be clear, by the way. Mechanicals are also claimed to be without issue. Apparently the car exhibited a lumpy idle at one point but that has been corrected. The mill is Mazda’s tidy little DOHC 2.5-litre V6. That was good from the factory for 164 horsepower and 160 lb-ft of twist. A nice little detail in the Probe is that it carries the Ford Blue Oval on its cam cover castings rather than the Mazda label. Behind that engine is a Mazda five-speed stick. Coming along with the car is a box of parts and manuals, since it’s old and you’ll probably need them. You also get that super styling and all the fun history these cars embody. Would you pay $2,600 for that? That’s the asking and regardless of the appropriateness of that amount I think we can all agree that the car has been presented by its seller at its best, albeit with its flaws called out. That’s to be respected in my book. Your book may be different—it’s probably not a coloring book. In that case, you might have a different view of this Probe and that price. That’s just what we’re here to find out. What do you think, is this obviously well-cared for Probe worth that $2,600 asking? Or, is asking that much about as believable as the claim of having been abducted by aliens? H/T to DoubleAgency for the hookup! At $36,000, Might This Hemi-Powered 2008 Jeep Wrangler Wrangle Itself a New Owner? At $2,500, Is This 1999 Chevy Suburban a Bargain Even When Not Considered by Dollar Per Foot?